I added a miniature razor knife to my belt pack a while ago and was struck by the fact that the blade didn’t lock shut. While having it pop completely open is unlikely, just the thought of a razor blade sliding around next to my hip was unsettling. With the knife closed, use a carbide scriber to mark the blade holder at the end of the locking lever that extends across the back of the knife. You’ll be grinding / filing a notch in the blade holder behind that, just large enough for the locking cam to snap into when the blade is closed. The only vital measurement is the line you just scribed. 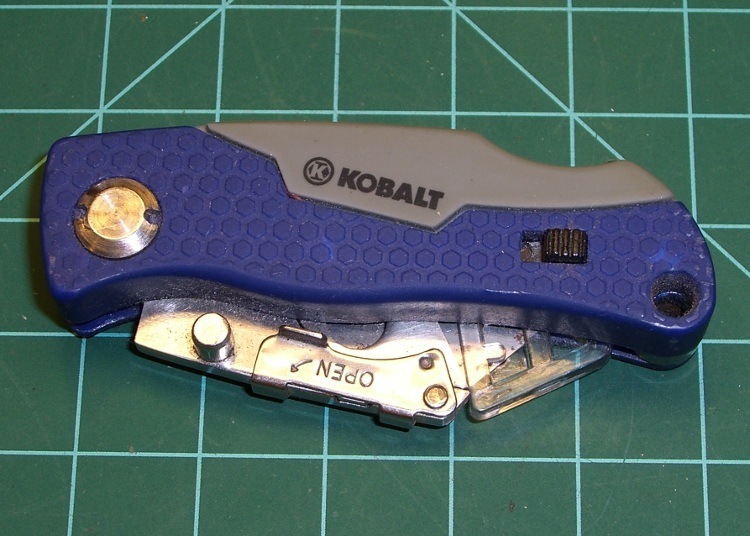 Lock the blade holder open, then remove the sharp blade before you do something truly stupid. Unscrew the Torx-06 screw that holds the locking lever in place, then remove the lever. It’s spring-loaded and will probably bind on the screw, so display some adaptability. 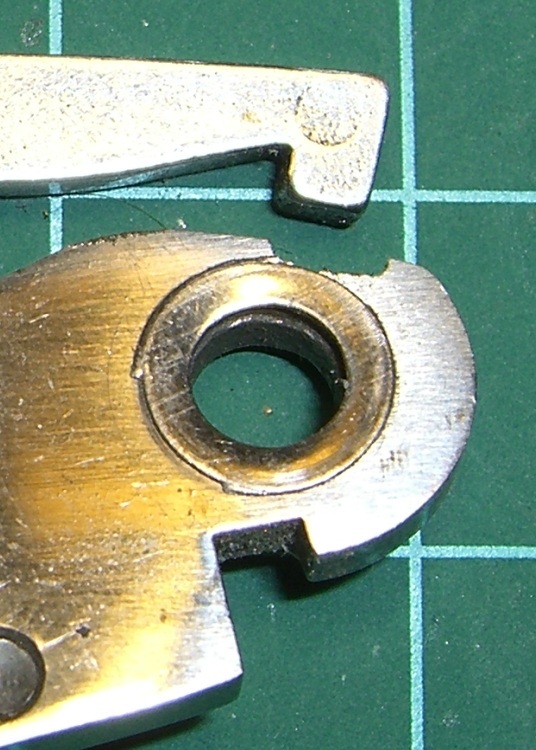 Use a pin spanner to unscrew the blade pivot bolt from the front panel of the knife; hold the corresponding rear nut in position with another spanner or just jam a screwdriver blade into one of the notches. Pretty much everything falls apart at that point, although you may have to do some wiggly-jiggly to get the blade holder out. 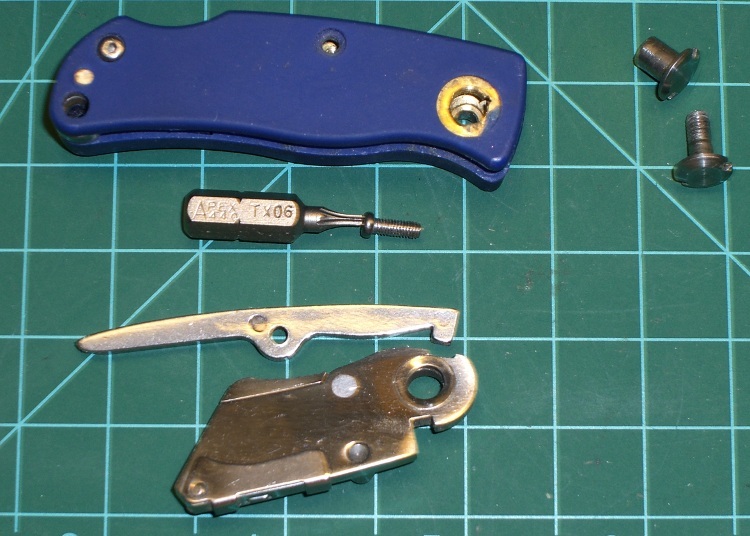 The washer seems to be swaged into the blade holder hole on my knife, which may be poor production QC. 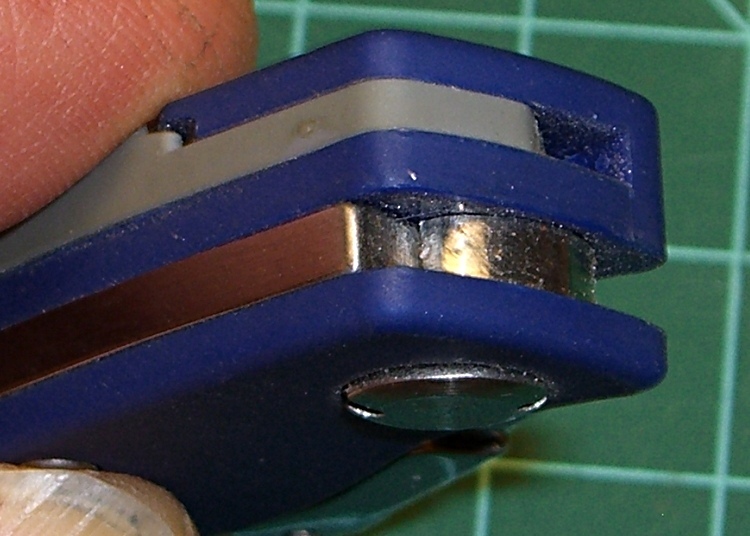 Using a file or a Dremel-class grinder, gnaw a notch into the back of the blade holder that just barely accepts the cam on the locking lever. This will probably take a few trial assemblies to get right; the notch on mine is slightly too long on the body side (left in the pix), which is OK because the blade holder doesn’t pivot in that direction. If you go beyond the line you scribed earlier (to the right in the pix), the blade holder can pivot open just slightly… and it turns out that the point of the razor blade isn’t all that far inside the knife body. Anyhow, here’s a detail of the notch. It’s not nearly as pretty as the notch on the other side of the hole that locks the blade open, but it works just fine. When you get everything back together, the blade holder should snap into the new notch when you close the blade. To open the knife, press down on the far end of the locking lever to pull the cam out of the notch, open it as usual, and the cam should snap into the old notch to hold the blade open as usual. I keep the goofy plastic safety dingus on the blade anyway, being a belt-and-suspenders kind of guy about that sort of thing. For what it’s worth, you can’t get into concerts with one of these in your belt pack… for well and good reason, I suppose. They let me hotfoot it back to the van, rather than confiscate it, which is probably one benefit of being an Olde Farte.